Writing about the Workshop,”Turn Old Clothes into Rag Bowls” and much more as it turned out . As you may have seen the photos of the day we had a fab time . Josephine explained and demonstrated the process about how we may make a basic bowl . She brought books and many examples of what could be achieved and some exhibited pieces of her own which were amazing . We were inspired and went about producing various shaped bowls and mats. The colours and shapes were all different . A very big thank you Josephine and for all who took part and particularly the committee members for organising the day. Feel sure we will use this technique in other aspects of our stitching projects . Gill Roberts gave an interesting and humorous talk on her creative journey at this month’s meeting. Her talk and the items she brought along for us to see, illustrated her skill, progression and involvement in embroidery and textile work. The talk was enjoyed by all attendees as we learnt her journey started in childhood and didn’t manifest into creative paid work until she cast off her old life of an accountant. Like many of us Gill’s home life was wrapped in textiles, helped along with mum’s dressmaking and knitting, and nan’s crochet creativity. Amazingly Gill still owns her 1st school project of a beautiful embroidered apron! 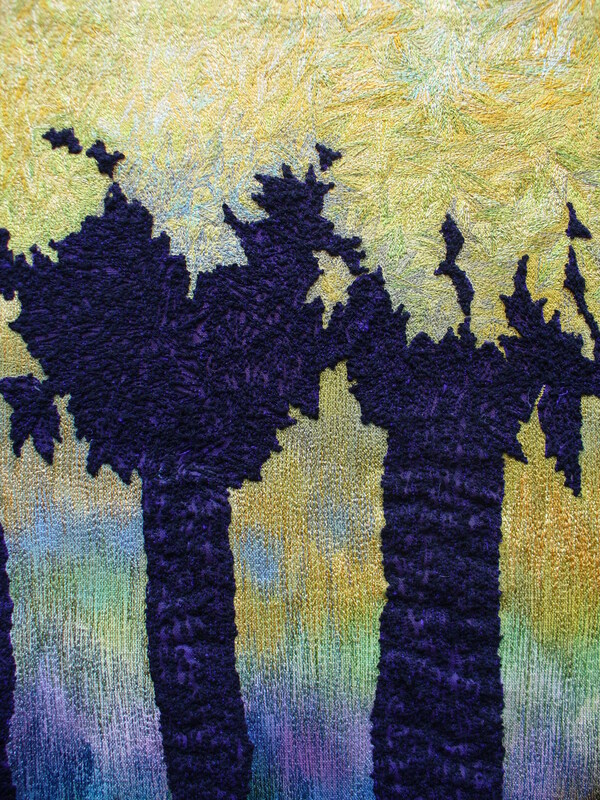 However, her embroidery fascination gathered speed as an Embroiders Guild member. We learnt that sometimes having a partner in crime is a good thing in the form of Margret Gold. This friendship began with helping with the Y.E.G. which flourished into education buddies egging each other on through projects to completion. The beautiful and intricate examples we could get close and personal with included corsets, corset wedding dress, occasional wear corset dresses and varied technique samplers’ portfolios. We were also treated to a portfolio and examples of Kaffe Fassett inspired bags for a level critical research study. Gill also gave us some behind the scenes info on various MEG projects including her involvement with retail brand HomeBargains ’08 Tapestry community project in St Georges Hall, recounting the memorable encounter with the business owner. This journey culminated into an Etsy shop selling bags to customers all over the world, and locally bespoke corset special occasion wear embroidery, goldwork, beading and knot work, Church embroiderer and repair work. 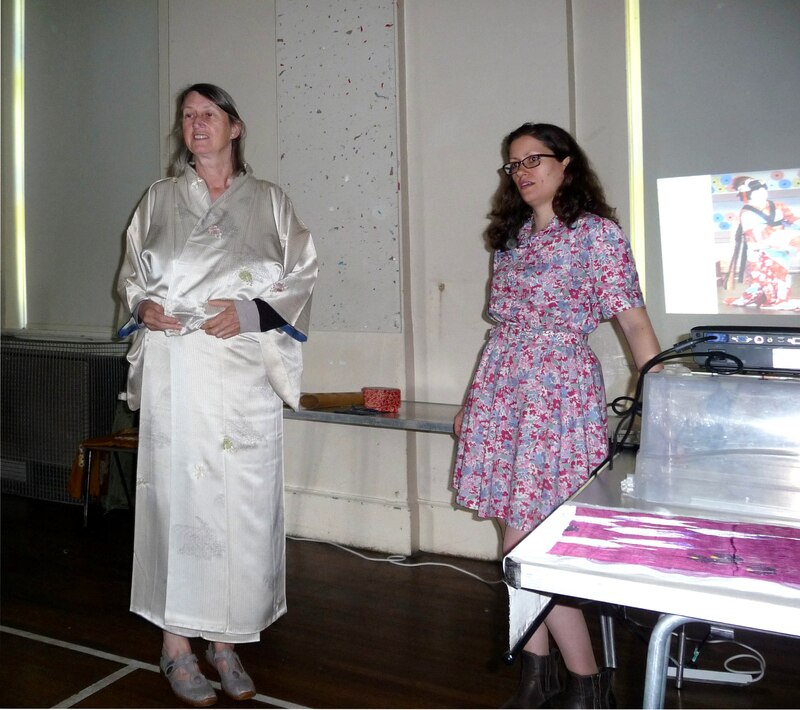 Vicky Williams gave a most interesting and enjoyable illustrated Talk about the Embroiderers’ Guild Collection. This collection was started IN 1906. It was moved from place to place in London including Hampton Court and Wimpole Street. It is now in Buckinghamshire Museum in Aylesbury. All items have to be looked after to museum standards and there is even a “grab list” showing which pieces have to be recovered first if there should be a disaster.There is an acquisition list for desirable pieces to be obtained by the Guild. The library contains illustrations and books which can be read there, but embroidery samples or folios can be taken out to different guilds. The oldest piece in the collection shown is a pair of kid gloves with embroidered cuffs. Various items were shown ranging through the 16th century to the 20th century. Each era had its own stylized features of stitches, colours, designs, materials and uses. the smallest piece in the collection measures less than a ten pence coin, while the largest takes up a whole wall. There are many sets of international embroideries and lots of childern’s sample pieces. During the 1930’s kits were made for the Forces by Penelope and men’s playing cards and embroidery samples can be seen. To end the splendid illustrated Talk we were shown pictures of the wonderful Hirst Millennium caskets made by Barbara and Roy Hirst. This workshop used alcohol inks and plastic sheeting, together with free machine embroidery to create tote bags or book covers. a small piece of felt was added to a wooden block and a tiny dot of alcohol ink added. This was then applied to the plastic sheeting in either a random pattern or to suggest flowers etc. More ink and different colours were applied to build up a picture, Drops of alcohol could be added to spread or dilute the applied colours. The block could also be used to make straight lines on the plastic. Once completed, the sheeting was placed face down onto the metallic fabric to prevent smudging. The sewing machine was set to free machining and free machine embroidery used to define areas. Edges were then zigzagged for neatness. The end product was a lively, durable bag or book cover. * Men banned embroidery practice when women made dowry; ban still not been lifted, as a result danger of skills and techniques dying out. HOW DO YOU CHANGE THIS SITUATION? A question Emma asked and of course this was answered by Ghandi who wanted to work with women – skilled artisans. He set up a system for utilising scrap fabric, creating a paper factory which now produces amazing beautiful paper. Here everyone is paid the same with a share of the profits. There are huge past links with Manchester cotton mills. In Ahmedabad they use an ancient press which came from Manchester; this is used to extract water from the paper. Emma has joined forces with Lokesh who she met through the Curator of Manchester Craft and Design Centre and who has become a project collaborator with Emma, Emma has taken a post in Dhaka with the Art Summit and will return soon with a brief to raise funds to continue the work of the school. We had a lively, interesting and inspiring talk from 3 members of the Bolton Group and really appreciated their willingness to share their amazing talents with us. Eileen Pepper explained that her inspiration came from her fascination with history, especially the Tudor Period and Elizabeth1. She showed us some lovely small pillows and bags like the ones which would have been given as presents to Elizabeth1 at New Year’s Eve. They were filled with herbs and decorated using Blackwork, Appliqué and Goldwork. There were also some beautiful examples of Knot Gardens all worked with incredible skill. We all loved the Sampler done in canvas work for a small child. Barbara Ryall’s beautiful work is inspired by the buildings in and around Bolton, especially those connected to the Cotton Industry and the ornamentation on the buildings. She has also researched the Cotton Industry in the area and studied the archives in the Bolton Museum. She dyes her own fabrics in a limited range of colours and uses: Templates, Lino prints, Batik, Applique and Discharge paste/bleach to achieve some wonderful effects. Her pieces usually include stab stitch and seeding stitch to pull everything together”. She showed us an unusual collar which was made entirely from fabrics used at the turn of the 20th century. Waistcoat shapes, relatives’ faces and an Edwardian stamp were included. It was a stunning garment. There were 3 beautifully dressed dolls and a stumpwork knight with a woven background called “In the dead of Knight” among many others. A highlight was the large family collage which included photographs and family references. No meeting during May 2018 because it clashed with the Royal Wedding and the FA Cup Final, and so was cancelled. We welcomed back an old friend and popular tutor Sarah Rakestraw from Golden Hinde, to take us on an interesting Journey into Goldwork basket weaving, each using 1 of 3 pre-chosen designs, a fish, a cross or bulrushes. We had all received the starting pack in the form of some templates & a card of string. Well there was the first interesting part of the day! Who would have thought that string could be so daunting? Some arrived with no stringing done, others had tentatively started but then possibly lost their nerve to go further, some of course had beautifully couched strands, whereas in the case of yours truly it seemed to have reached the point of being more of a rope than string. However such is the mark of Sarah being a totally patient & professional tutor that she wasn’t phased in the least. She went round the class getting the non-stringers started, corrected any mishaps with others and still managed to be able to show us all how to start properly before the first cuppas had been finished. All 3 designs started with the basket weaving technique using 2 strands of Jap gold couched with either a contrasting thread or one meant to invisibly blend in. Each row started & ended with the Jap gold being plunged through the fabric and overstitched on the reverse. The first few rows covered alternating double blocks of string and subsequent sections covered single blocks of string. At this point we could all start to see the different weaving effects coming together. After lunch we moved on to areas of the designs which were more decorative, in the form of short lengths of purl wire sewn closely together over the string. It was at this point that everyone’s design began to take on a degree of individuality as people started experimenting with colours. Finally Sarah showed us all different ways to add little finishing touches to make each deign our own unique piece. None of the pieces were finished on the day but I’m sure everyone went home with an understanding of each phase of the process, and I’m also sure that everyone thoroughly enjoyed Sarah’ excellent presentation and that we all learnt something new. Branch member Gill Roberts brought six wedding dresses to show us – five of which she had made herself! We were surprised to hear that originally, wedding dresses were not just for the big day, but were expected to be worn for ‘Sunday best’ and at other occasions for a few years after the wedding. Dresses were often coloured to show that the wearer could afford to buy expensive dyed fabric and white was rare because it was hard to keep clean. Demure attire was required for church, so brides wore long sleeves, which could be detached for the party later on. The party was important because it was the first occasion on which the bride was presented as a wife. At an 18C country wedding, the dress would be made of coloured and patterned block printed cotton, with an over skirt looped up over a petticoat. After the wedding, the skirt could be let down to become a formal dress for special occasions. A more affluent bride would have a silk dress with fresh flowers sewn onto it on the morning of the wedding. Veils were generally worn at evening parties, at the back of the head throughout the year and thought of as a ‘peasant tradition’ if worn at weddings. It was Queen Victoria who popularised the white wedding dress and the veil. Her outfit was photographed and published in papers and magazines. Everyone wanted to copy royalty so if they could afford a white silk dress with lace and orange blossom, it became a handy way to show off the bride’s family’s wealth. From the 1920’s onwards, the shape of wedding dresses became more relaxed due to the lessening popularity of corsets. They also became shorter. 1940’s brides could not easily obtain dress fabric and so used furnishing fabric, their service uniforms or parachute silk. Queen Elizabeth II’s dress was inspired by Botticelli’s ‘Primavera’ painting and had floral motifs embroidered over the fabric. By the 1950’s, ready to wear dresses were available and the 1960’s produced coat dresses and later in the 1970’s, crocheted dresses. We loved seeing the wedding dresses from different eras which Gill had made and her humorous and knowledgeable style made the talk fly over. We would have liked to have heard much more! thread for the body and veins in the wings. or figments of our imagination. we could ask for advice. particularly on time stumpwork can be but it was a most enjoyable workshop. As soon as Bee arrived and began to unpack her colourful garments, wools and crafts there was a real buzz of excitement. She began by telling us her trade name was no longer Crafts from the Dungeon ( she had her studio in a cellar) but was now Crafts in the Clinque as she has moved to an ex prison! Bee begins all her weaving by putting a ball of multi-coloured wool in a basket and then adding textures by choosing wools from her extensive collection. She said “ If you like the basket, you will like the finished work”And we certainly did. As we “sashayed” out in turn to model the garments, Bee explained how she had made the weavings and the garments. The most important thing to remember is “that you are making a fabric”. She introduced us to warps, wefts and Heddle looms and told us a very funny story of how she purchased a 7 ft Tri-loom on ebay. It was a very lively and entertaining talk with a lot of audience participation. We all enjoyed it and had a lot of fun as well. Many of us bought kits as we were inspired to “have a go”. It will be great to see the results.